A kiai is a loud shout. It is that essential element used by the heroes and villains of martial arts movies to accent their action, something that testifies that they are not mere boxers or wrestlers but trained experts in an Asian discipline such as karate or kung fu. But unfortunately what we hear no longer bears much combat significance. The true art of the shout, or kiai jutsu in Japanese, can be an effective tool of self-defense capable of having physical effects on an adversary. The year was 1961. I was in Japan studying karate with Kancho Mas Oyama, the founder of Kyokushinkai karate.After practice one evening Oyama and I made our way along a dirt street on the outskirts of Tokyo.We were heading toward a Korean restaurant, a favorite of his where we often ate. It was getting dark and as we approached the restaurant in our path were several young men jostling and pushing each other. Suddenly the group seemed to lurch toward us. Oyama stopped and then uttered a short, powerful sound, something between a grunt and a soft shout.The youths froze.All action stopped, their bodies seemingly frozen, movement suspended as if energy had been sucked out of their limbs. It seemed like an eternity, but it must have been only a second when the youths regained a little composure and turned. They met the wall of Oyama's powerful look, thick eyebrows framing piercing eyes. Immediately they melted aside, then quickly disappeared down the street. No doubt Oyama's powerful presence also had an effect; he was, a powerful looking, tank like man with a thick neck and massive chest accentuated with shoulders so wide they seemed out of proportion. Not a word had been said. "What was that?" I asked, dumbfounded. "Ahh, nothing," Oyama replied in broken English as he resumed walking toward the restaurant. 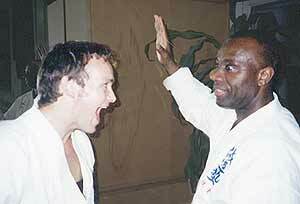 This was my first introduction to the power of kiai. I had of course seen people kiai in class, we all did this during exercises, but nothing with the power and impact that Oyama had emitted. That night I returned home around 10 pm still thinking about the incident.I was living with a group of martial artists hosted in an old Meiji period house atop a hill in a suburb of Tokyo called Ichigiya. The house was run by Donn Draeger. Donn was home and I went upstairs to talk. I described Oyama's kiai to him and we began to talk about the subject. Donn, it turned out had a powerful kiai himself and soon we were trading kiais, Donn coaching me on keeping my air passage straight and using by lower abdomen. Our alternate "Yaaaahs" reverberated through the building prompting at least one "shut up" from a house mate. Donn also related to me his own personal experience with a kiai. Donn was a devout student (practitioner and well known historian) of the martial arts. He was highly ranked in many disciplines including judo, the jo and katori shinto ryu kenjutsu, a classical school of swordsmanship with probably the oldest historical tradition in Japan, dating from the 1400's. He had trained in this kenjutsu for many years where two man kata were theprimary means of teaching. There was one high level kata that he did not understand, however, in which the two swordsmen at one point were too far apart to have any contact. Nevertheless he practiced as prescribed until one day he felt compelled to ask his teacher the meaning of this odd long distance. After class he approached his teacher, and although a student is not supposed to question, Donn told the teacher he didn't understand what was happening. The teacher replied, "Get real swords." They began the kata and when that point of distance was reached the teacher emitted a thundering shout, at which point Donn said he was literally thrown backward onto his back. As Donn looked up the teacher said, "that part for 'ki" (vital energy believed to run in the body that can be stored and used for martial purposes). How true or authentic the story was, I will never know. But, being 19 and listening starry-eyed to the story of such an authority and skilled exponent, at the time I believed every word. In the years since I have tried to make sense of the kiai. Some believe it is little more than a loud shout that creates a startle reflex in those that it is aimed at. Others believe it is much more. The word "kiai" itself suggesting many things. The "ki" in kiai refers to energy, (chi or qi in China), believed to be an essential force behind health and vitality, but more so, something able to be nurtured, built and stored within the body for use. "Ai" means to meet, harmonize, join or fuse.Thus by this definition kiai is more than an explosive voice sound; it represents the projection of sound fused with energy or spirit that blends with the energy or spirit of the opponent, thus having an effect. When the two syllables are reversed you get another related martial arts term, "aiki", which means the meeting or harmonizing of energy (ki) central to aikido and aikijutsu.Kiai refers to spirit or vital body energy that interacts without physical contact, while "aiki" refers more to the physical energy of movement. The two are very much related. One famous martial arts teacher who seemed to demonstrate the power of kiai repeatedly was Morihei Ueshiba, the founder of aikido.In one video which shows him doing techniques in the latter part of his life, there is a sequence in which an attacker is literally blown back off his feet by a kiai uttered by Ueshiba. Is this a demonstration of real power or just the reaction of an apprehensive student all too willing to follow his teacher's lead? Actually, I believe it is the former. My aikido teacher, Roy Suenaka Sensei, who studied with Ueshiba in Tokyo, recounted to me an experience that happened around 1961. "There were a lot of times that Ueshiba would use me as uke (attacker) and practically every time I attacked he would kiai, and I would become airborne. One day during one of his lectures he started to talk about ki and how it could be extended outward through an object." Ueshiba was holding a chop stick and called Suenaka up to be his uke (partner). "I didn't know what he was going to do. He asked me to attack and suddenly I went flying. The next thing I knew I was on my back stunned with no idea what had happened. When I went back to sit down I asked another student about what Ueshiba had done. Someone said I had been hit on the forehead by the chopstick. When I looked later, sure enough, there on the top of my forehead was a little red indentation." In his famous book "The Fighting Arts of Japan," E. J. Harrison refers to one incident which tends to confirm the mystical power generated by the kiai.Harrison tells the story of Yagyu Matajuro, the son of a well known sword master and tutor to the Shoguns (military rulers) whose misconduct resulted in his disinheritance by his father.Determined to make amends, the son over several years studied the sword diligently with a number of masters before returning home to Edo (now Tokyo) to plead through an intermediary, who was a close friend of his father, for reconciliation.Matajoro, seeking to demonstrate his skill, asked for an opponent, but since none was immediately available said he would instead demonstrate his kiai. Matajuro looked into the garden and saw a few sparrows perched on a branch of a pine tree. Fixing his gaze on them he uttered his kiai (shout) and the birds fell to the ground senseless.When Matajuro removed his attention from the birds they soon regained consciousness and flew away. The demonstration had the desired effect, and the intermediary was able to achieve reconciliation between father and son, who went on to inherit his father's system.Harrison notes that this feat was known in Japanese sword schools as "toate-no-jutsu," or "the art of striking from a distance." In the past the art of kiai, or kiai jutsu, was a highly esoteric and secret discipline often taught to professional warriors, or senior students of martial arts. Donn Draeger told me, however, that he felt that over the last century a lot of esoteric knowledge as well as technique was lost as martial arts became popularized, practiced by non-warriors, and turned from warrior arts to philosophical disciplines of the masses. The art of kiai suffered this fate as well.Now, if the art is taught at all, it is taught only to senior students in a few martial disciplines. Still, virtually all martial arts practice the kiai in some basic, simplified form. They are often part of basic practice. 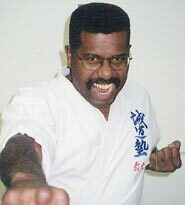 In karate a kiai often accompanies the practice of basic techniques, and is used in self-defense and freefighting. In aikido, aikijujutsu and jujutsu the kiai is used to startle the attacker, especially if the attack is a grab, so as to momentarily distract the attacker from his original intent and allow the defender more easily to start a defensive technique. A future article on kiai jutsu will discuss a number of theories on the operational principles of kiai jutsu. Christopher Caile, the founder and Editor-in-Chief of FightingArts.com, is a historian, writer and researcher on the martial arts and Japanese culture. A martial artist for over 40 years he holds a 6th degree black belt in karate and is experienced in judo, aikido, daito-ryu, itto-ryu, boxing, and several Chinese arts. He is also a teacher of qi gong.